Enhance the appearance of your public areas and encourage the proper disposal of litter with these recycled plastic waste receptacles. 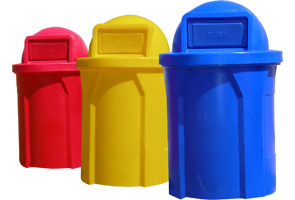 The four unique use specific tops and a variety of color options to mix 'n' match provides several versatile waste container options to meet the demand of your waste management's needs. Made from recycled plastic polyethylene, these waste receptacles are ideal for use both outside as well as inside. They will not fade, rust or crack. The four molded-in handles make moving it around a breeze and the removable inside plastic liner eliminates the need for costly garbage bags. Made from durable Polyethylene that will not fade, dent or crack. There are no springs or hinges to rust or wear out. Unique molded in-handles make it a breeze to move around. Two 9" x 12" Carve-Out for Signage; Branding, Messaging and Labeling. Removable, easy to clean liner included. 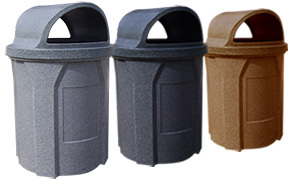 All recycled plastic trash receptacles are available in the color options as shown. Encourage compliance with your recycling program with the 4" and 10" Recycle Top designed specifically to only accept bottles and cans. The Bug Barrier Top is perfect for those playground and beach areas where yellow jackets prefer to build nests. The precise fit between the door and cover prevents undesirable insects a means of entry. The 2-Way Waste Top is ideal for areas with multi-directional traffic and requires a high volume waste collection container. The concaved lid discourages the placement of garbage on top of the unit and prevents rainwater from collecting in the waste receptacle.